Do you hate waste? Hate throwing things out when you’re sure that something could be done with them? Looked at that tired lampshade and that beautiful silk scarf with the hole in it and thought there must be some way to make them both wonderful again? 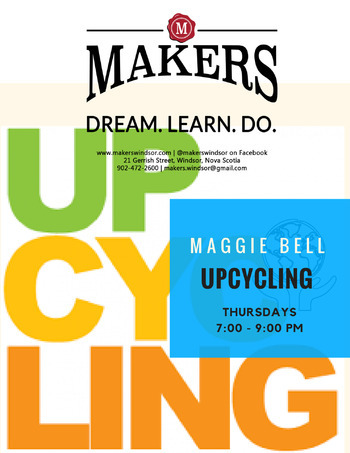 Well, Maggie Bell has an activity just for you. Then using your own item(s), or something someone else brought, along with whatever you can find around Makers, you will create something new and awesome from things that might have otherwise been considered junk. How cool are you? You use items brought by the group and whatever you can find around Makers. Depending upon what you decide to make and what supplies you can forage from Makers, you may have to purchase some supplies separately to complete your project.